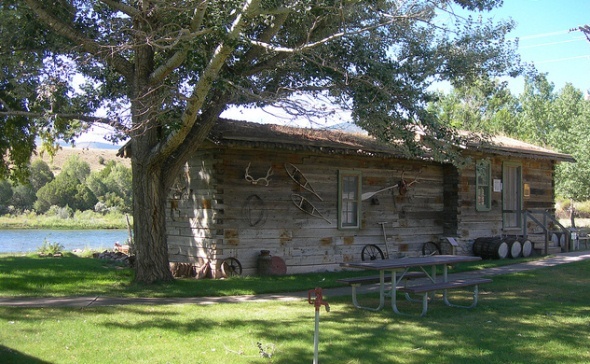 The John Jarvie Historic Ranch features a ranch house, blacksmith shop and corrals, plus a replica of the trading post and general store that drew Brown’s Park residents as well as outlaws, including Butch Cassidy’s Wild Bunch, in the late 1800s. The ranch was owned by Jarvie, a Scottish businessman who arrived in 1880 and settled on the land because it had a natural crossing for the Green River. Jarvie’s one-room stone house, built by the outlaw Jack Bennett using masonry skills he learned in prison, serves as a museum with displays and a video about the ranch’s history. Nearby is the two-room dugout where Jarvie and his bride, Nellie Barr, spent the first winter after their wedding in 1880 while waiting for their home and the trading post and general store building to be completed in 1881. The ranch headquarters also has a blacksmith shop and corrals made from hand-hewn railroad ties that drifted down the river from Wyoming. The general store is a replica of the original, with wood walls and a sod roof. It is furnished with artifacts from the late 1800s and the original safe, which was robbed by two men who murdered Jarvie in 1909. Today, the ranch is run by the federal Bureau of Land Management.